I was approached by pv.body a few weeks go to review their athletic wear subscription service. The company concept is pretty neat. You take a quiz with questions about the fit, colors, and styles you prefer in tops and bottoms, as well as the types of workouts you usually do. Then, using your style profile, pv.body will send you a new outfit every month. It’s a pretty good deal at $49.95 a month (and no shipping, even to Hawaii. Yay! ), especially is you buy a lot of athletic clothing. I took my quiz, and a week later a very snazzy hot pink envelope showed up at my door. Inside was a grey pair of American Apparel leggings and an “Alaaskan blue” adjustable cami from NUX, (which I had never heard of until then). Both are American made, which I’m into. 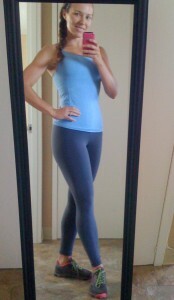 Priced out separately, the leggings would have cost me $44 and the tank $49 if I had bought them retail. So again, great deal from pv.body. Both pieces fit well and are of high qualit’y. The leggings passed the deadlift check (my whole behind is not exposed when I bend over) and I like the fact that the straps on the tank are adjustable. However, even though I like both pieces, I don’t think I would have ever picked them out myself. I generally don’t wear grey tights, because after a few miles outside or a few sets at the gym I’ll look like I have peed myself due to all the visible sweat. Maybe TMI, but true. I’m also not that into the ice blue color of the tank. Pv. Body has a pretty liberal return policy, so I could have sent either item back if I had really wanted to. I must not be the only person to be enthusiastic about the concept of being styled instead of choosing my own clothes, but then wishing I could have picked them out myself. Pv.body is launching a slightly different model in February: they are putting out their own line. Ellie, pv.body’s new, in house line, will come out with a new, 24-piece collection every month. You have the option of selecting your own outfit or leaving to the pros at pv.body. The pricing will be the same as the old subscription, $49.95 month, or you can purchase individual pieces at retail if you’re not into commitment. The February look book seems great, but I have yet to receive the actual product. If you’d like to try the subscription out, pv.body is offering you a 20% discount off your first month. What athletic apparel lines do you like? Would you use a subscription service for your workout clothes? 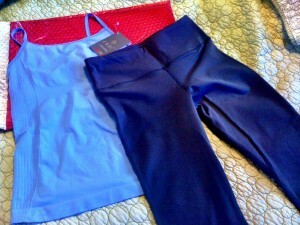 *I received this outfit free from pv.body in exchange for my review of the company.